Can we come lay in front of your fire too? bien au chaud. La photo est magnifique. beau dimanche. That's an excellent spot to spend a snowy Sunday! Great fireplace photo!! We know you will stay nice and cozy. That looks divine! What a great way to spend a snowy Sunday. Now, if it's the sander that's running - UTB is the way to go! You guys are SO smart! That's the purrfect way to do an easy! We agree that's the best way to spend the day. We're gonna ask Mama to turn on our fireplace. We might get freezing rain tomorrow. Oh, scary! That looks so warm and cozy. Purrfect for an Easy Sunday! How can Faraday sleep through all that NOISE? And how can both of them sleep through that SMELL?! That would make me crazy. Oh how cozy...there's nothing like a nice fire to warm the body. Happy Sunday! that fireplace photo is gorgeous! We're on our way over! Wow, that looks sooooo cozy! That look so warm and cozy! Thanks for asking about our Snowball - he is doing well so far. 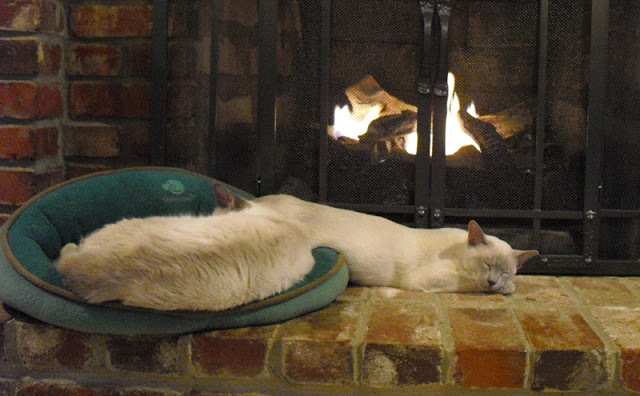 Yes boys - we mancats know how to enjoy a cozy Sunday afternoon by the fireplace (or ANY day by one for that matter!! ).....snooze on!!!! This looks like a perfect way to spend an afternoon. In fact, how about you scoot over and make room for me. That looks like the best place to be. That's the best place to be while that nasty snow is coming down! That fireplace looks SO cozy!! We have a fireplace, but it is not working...darn !! So relaxing by the fireplace. Watch the poly-whatchacallit and the fireplace. They stuff is VERY flammable. You are soooo right! It was chilly this AM but then it warmed up in the afternoon. 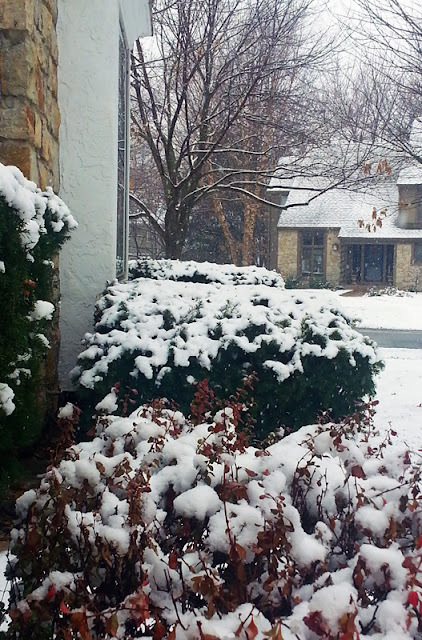 AND mommy shuffled us all off to the back bedroom again when the poly-stuff came out at 5 PM! We are on our way over! We got some of that icky white stuff too, but we don't have a fire place. Do you think your mom would make laktes for us too? Oooh now THAT sounds NOMMY! Looking awfully calm there, boyz. So where's Allie? Doing her nails? Washing her hair?